The commission overseeing the election of the new Patriarch of the Coptic Church will disclose the list of voters who will participate in the election of the new pope on Monday 23 July. The list will consist of 2,594 names and will be published in three national newspapers. The assembly of voters will consist of both clergy of various ranks and laity across all dioceses throughout Egypt and the rest of the globe. 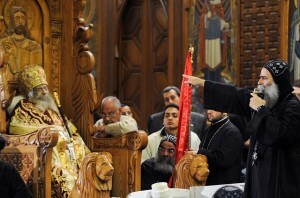 These voters include 12 voters from each Coptic diocese, Christian members of the press, clergy with certain roles within the Church, and current and former Christian government officials. The names will be displayed at the Cathedral until August 6 for the public to examine. From the following day until 20 August the door will be open for any appeals in the case of any objections to any of the names by the general public. An assembled committee will then spend an estimated two weeks considering submitted appeals. The current pool of nominees is made up of 17 monks and bishops, selected by members of the Holy Synod. A minimum of five and a maximum of seven nominees will be selected from this pool and after that the appointed electoral assembly will narrow the nominees to a final three. After a special liturgy, a lot is cast among the final three and a child randomly selects a name. The newly-elected pope will be the 118th Patriarch of the Coptic Church, succeeding the late Pope Shenouda III who held the position for 40 years. Following the Pope’s death, Bishop Pachomius was selected as acting patriarch and will hand the seat over to whoever is elected. Nominees include Metropolitan Bishoy of Damiette, former secretary to the Pope Bishop Youannes, and Bishop Rafael, auxiliary bishop of central Cairo and Heliopolis. The Bishop Pachomius also extended greetings for the Holy Month of Ramadan to President Morsy, Field Marshall Tantawi, Dr. Ahmed el-Tayyeb of Al Azhar, and the Grand Mufti Dr. Ali Gomaa on behalf of the Church as acting patriarch, as did Egypt’s Catholic and Protestant Churches. The Coptic Church has also announced that it will not attend the traditional yearly Ramadan Iftaar banquet in mourning for the death of Pope Shenouda III.